As parents of 3 young children who are home educated, our house is always in a state of chaos! 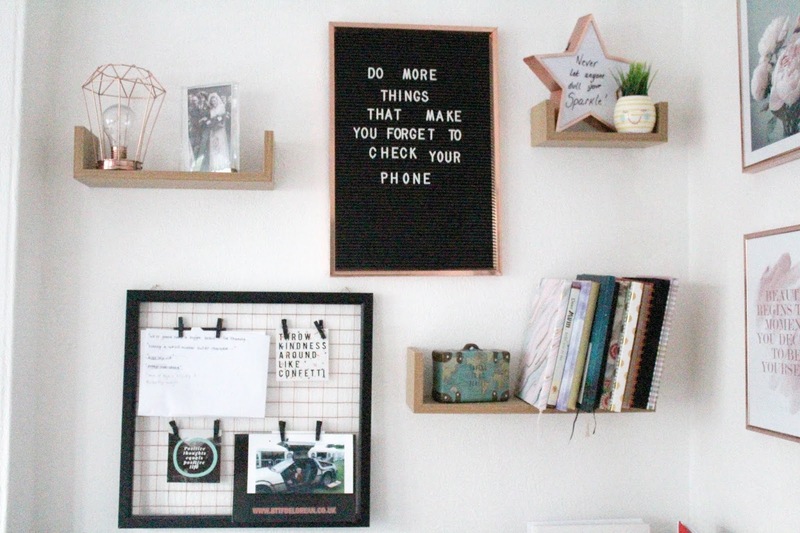 There just isn't the chance to keep things as tidy and organised as I'd like to because a) there's a lot of "stuff", b) there's zero child-free time to organise and sort things and c) the house is too small for us so its always going to look cluttered and cramped because it IS cluttered and cramped! 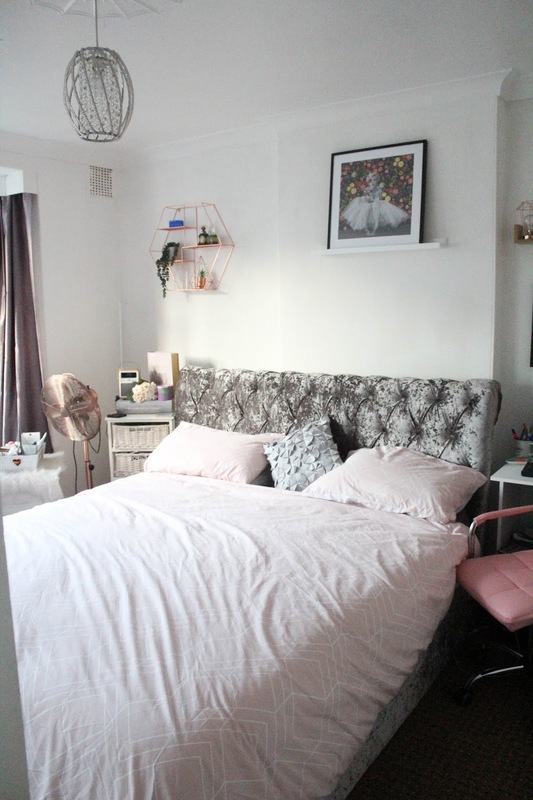 I've pretty much made my peace with the fact that our home will never be stylish and minimalist as long as the children are little, but I do feel the need to have one space in the house that provides a bit of a retreat for us and that's our bedroom. 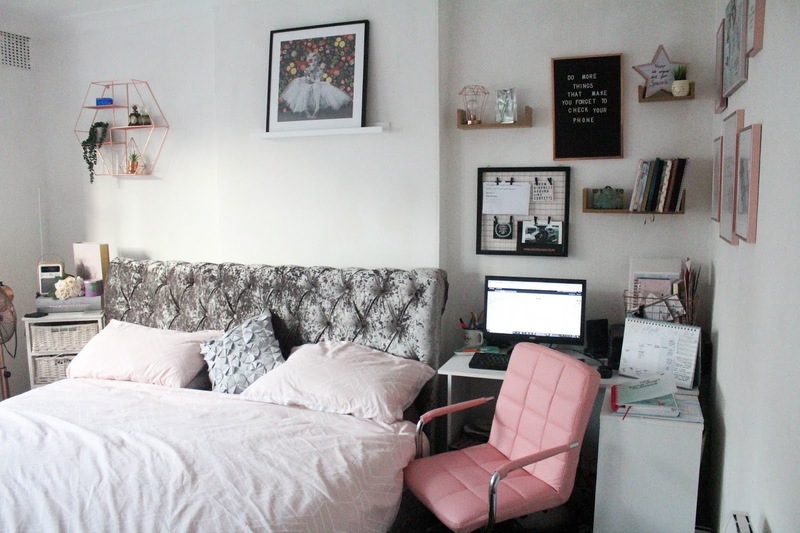 We decided to give the bedroom a bit of a facelift for the new year and splash out on some new bits to make it more comfortable...so I thought I'd give you a look at it. First up, we decided to treat ourselves to a new bed. 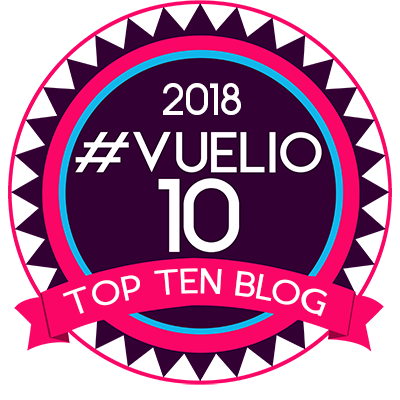 I've recently been diagnosed with fibromyalgia which is known to be strongly linked to sleep problems, and as someone who has always suffered with insomnia - this makes a lot of sense to me, so I thought that anything I can do to make sleep a little easier or at the very least make it easier to relax even if sleep isn't achievable...can only be a positive for my health! We'd had our old bed for a good 7 years and although we could have got a few more years out of it, it was starting to feel a bit tired. It was an Ikea standard double so not very big...if any of the children came through to our bed in the night (which they often do) then it felt very cramped, and the mattress was starting to get a bit uncomfortable in places too. So we decided that if we were springing for a new bed, we might as well go all out and get a massive one! 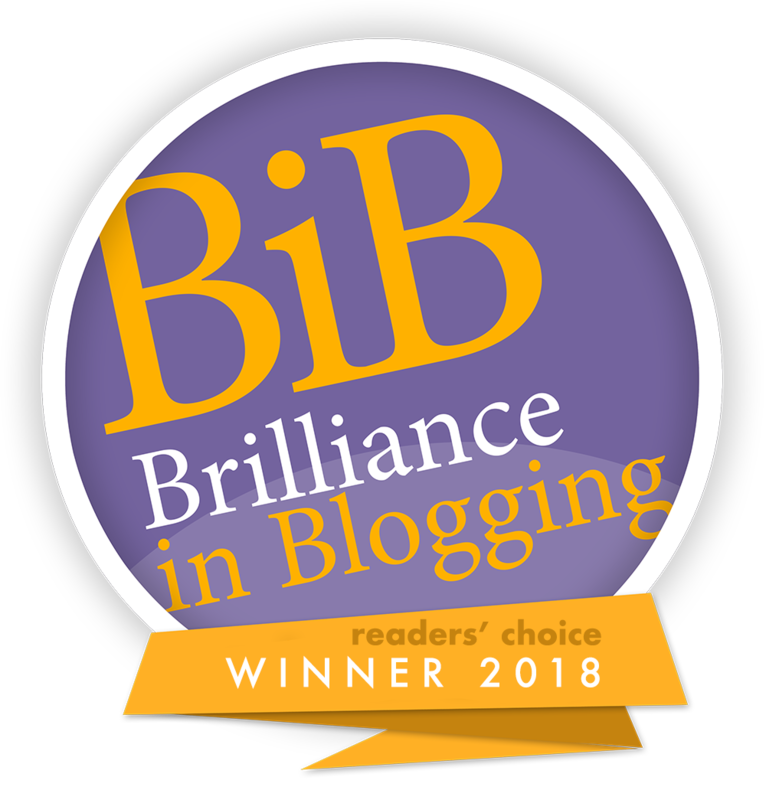 We went for a super king size bed from Next...we had quite a hard time finding one that would fit comfortably in the bedroom which meant that my preferred choice of a sleigh bed was out, but we found the Westcott bed and it was a perfect fit! I love the fact that it lifts up to provide storage underneath, and the super king size has been ideal - all 5 of us can comfortably fit in it together which has made for a lovely Sunday morning family routine of cuddles! 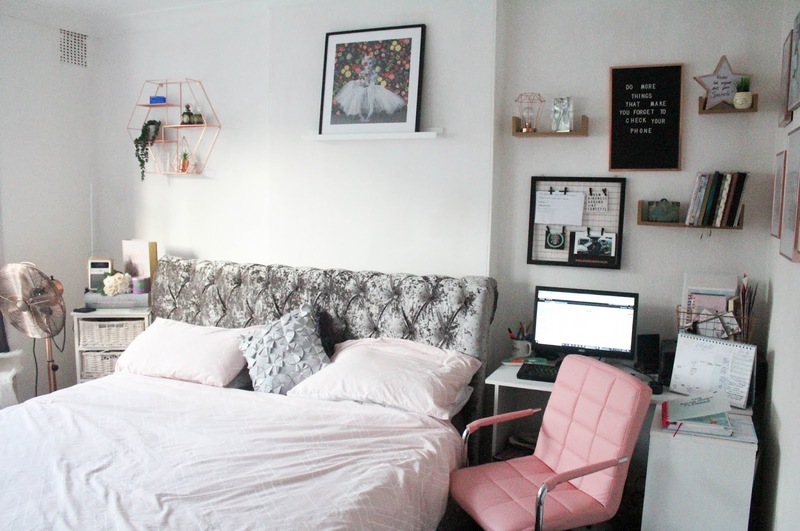 We're thinking about adding a TV to the room at some point as all of us love spending time in the bed now! Of course, a new bigger bed called for a new mattress and fortunately it timed well with an email I received from Simba offering me the chance to try out their Hybrid mattress. 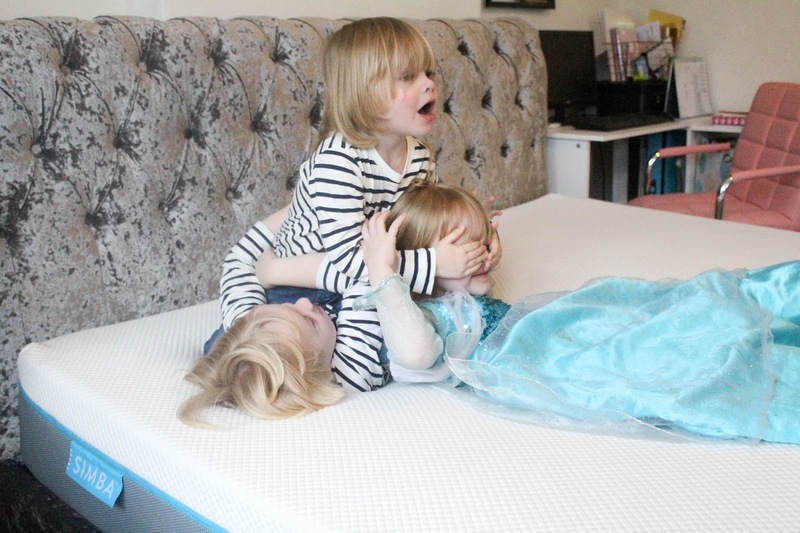 We've been using the Simba Hybrid Mattress for about a month now, and although it did take me a couple of weeks to get used to the change (I would say it definitely feels different from the spring mattress we're used to - it has less "bounce" and more of a feeling of sinking in if that makes) I have to say - I wouldn't change back. Made up of a foam core, with an outer layer of memory foam and a final layer of micro-pocket springs - it feels squidgy and comfortable, but also supportive and I didn't have any problems with sweating. As I said, it does feel different from other mattresses we've used - it has a softer feel and to begin with I did feel a bit like it was sucking me in whenever I laid on it, but after a few nights I got used to it and now I don't even notice it. What I do notice though, is that I'm falling asleep faster and staying asleep which is something I struggled with before. 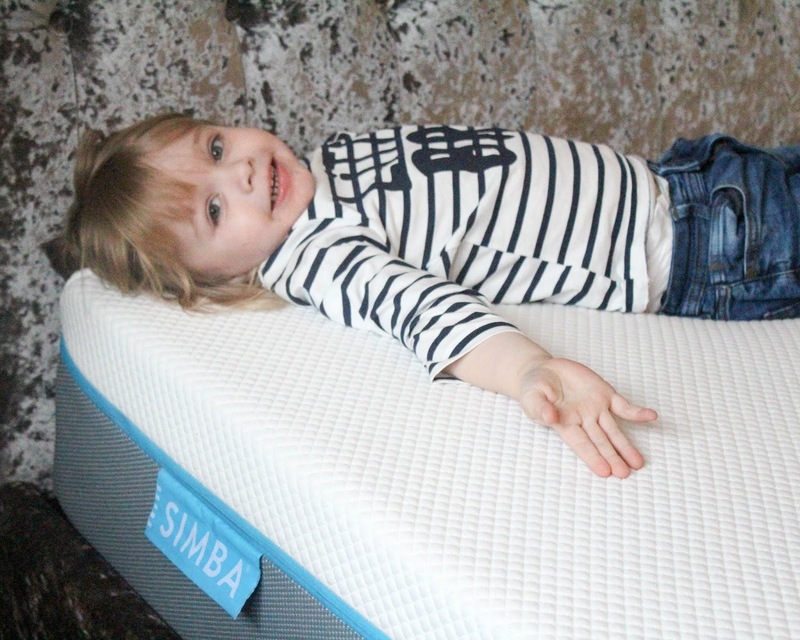 The delivery of the Simba mattress was great too, as they come rolled and boxed for ease - it was super easy to set up and even came with a cutting tool to help, after being left alone for a few hours it was ready to sleep on. 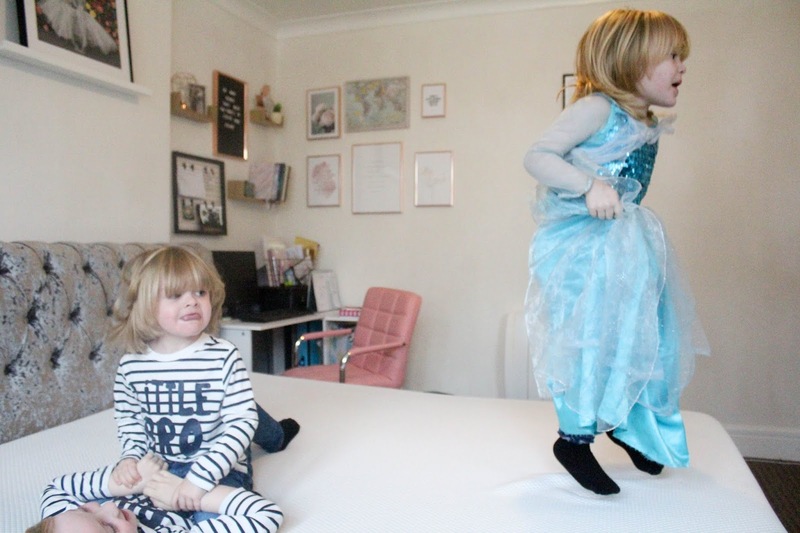 If you're still not sure if Simba is for you then worry not, as they offer a 100 night money-back guarantee if you're not happy - and any returned mattresses are donated to charity too. They also offer free delivery, free collection of returns and a 10 year guarantee - so it's about as safe a purchase as you can make! As I have already mentioned, our house is pretty small and so our bedroom also has to double up as my work space. 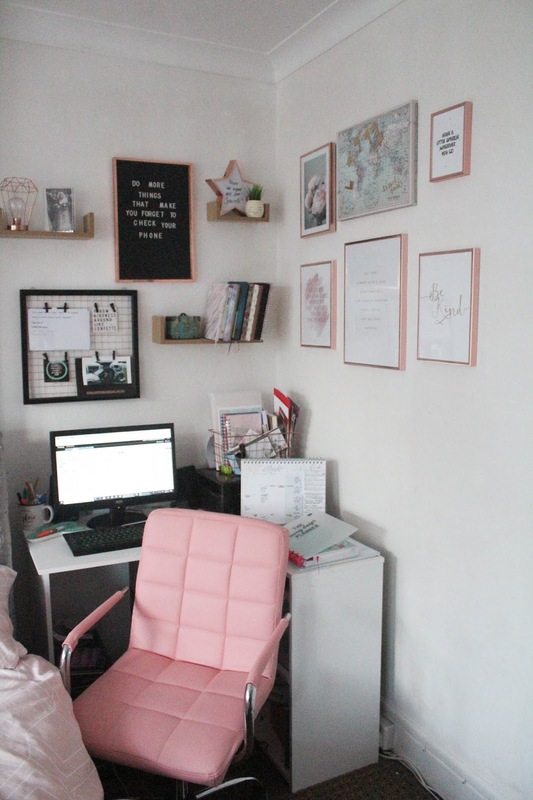 It's not ideal but it's the only space we have that works as an office area, so I use a corner desk from Argos and try to make sure that my workspace feels separate from the rest of the room while still complimenting the colour scheme. 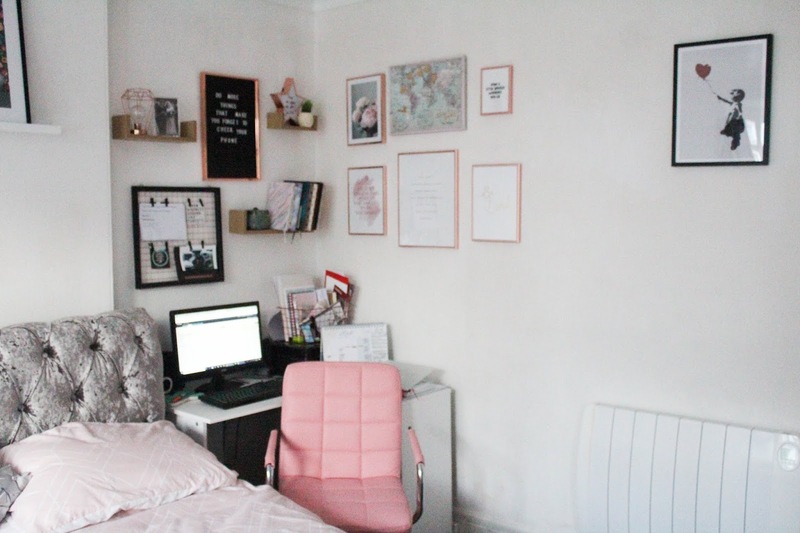 We recently replaced our decade old computer chair with a new one, and decided to go for a nice pink one as it matched the bedroom decor much more - I love the splash of colour it adds. It's this one from Amazon. I also added some wall shelves to the corner to give me more storage space for my endless notebooks, and free up more space on my desk too. 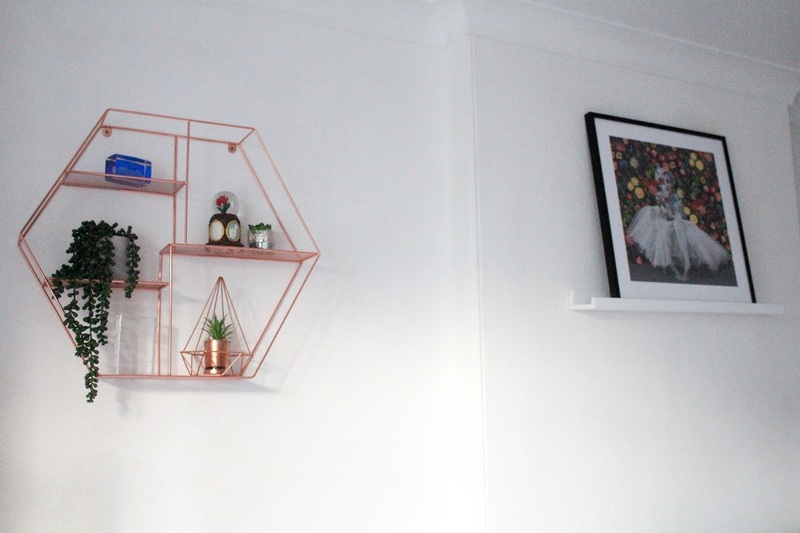 We also added this rose gold hexagonal shelf to the wall near the bed, which I absolutely love and a picture shelf above the bed - I was originally planning to put a print of the boys up here but I got this Marilyn print from Desenio recently and thought it looked nice and added a pop of colour. 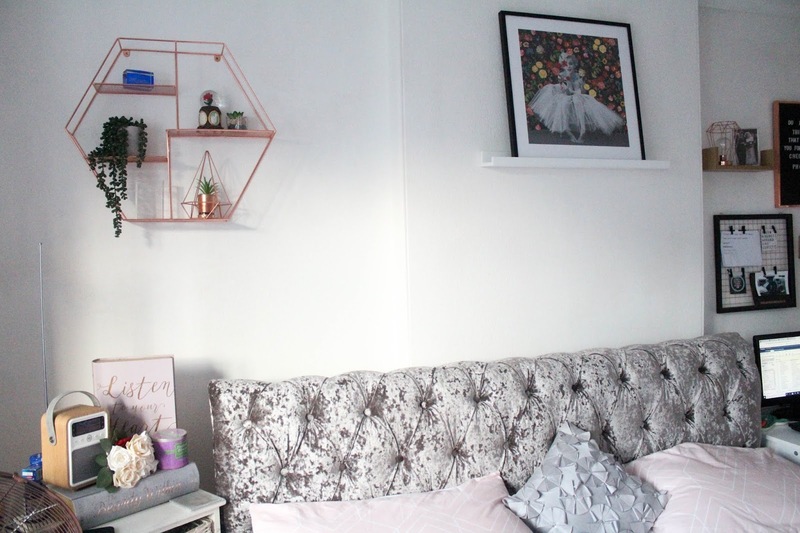 We also replaced my old dressing table...again I'd had it for years and it had seen better days, so when Wayfair gave us the chance to choose something from their site we chose the dressing table. It's a bit bigger than my last one, and the drawers are a really decent size - I love the grey colour, and it was so easy to put together too. 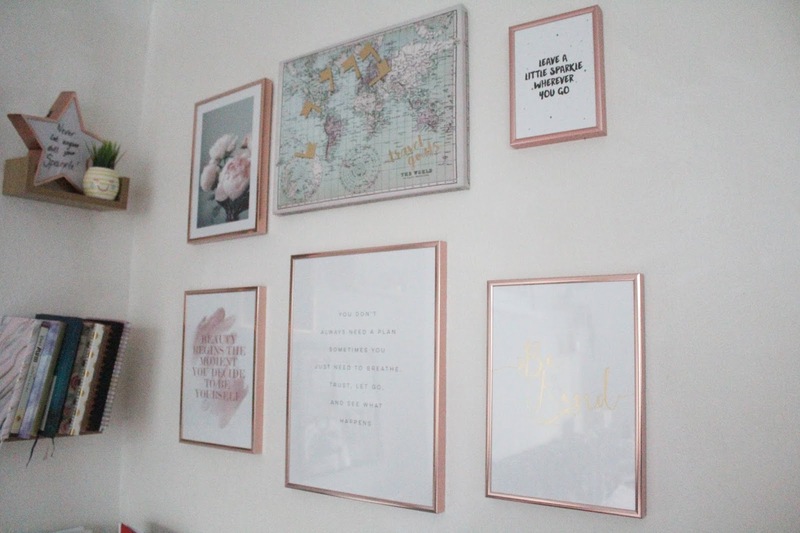 It's very sturdy and I think it looks fantastic in the room. 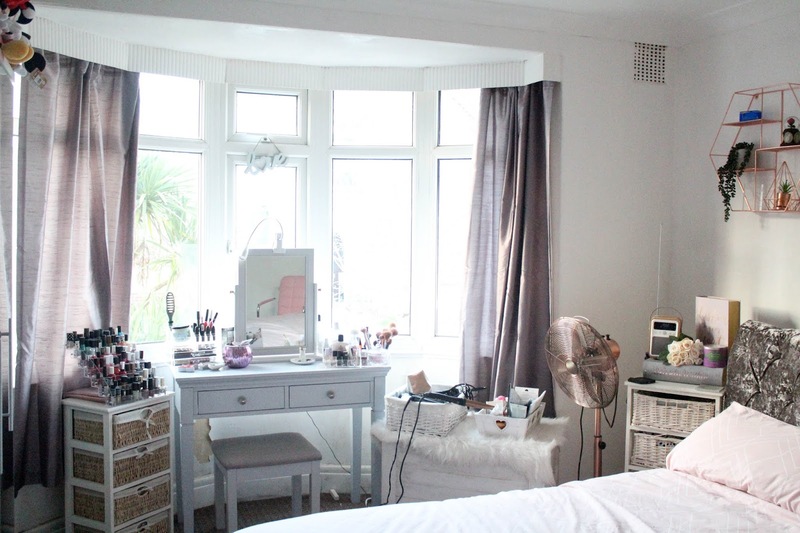 I was also quite pleased with my bargain curtains which were reduced to £15 in the Next sale! Unfortunately the bay window part of the bedroom is looking a bit of a shambles right now though, thanks to my children deciding to pick away at the wallpaper underneath the dressing table! 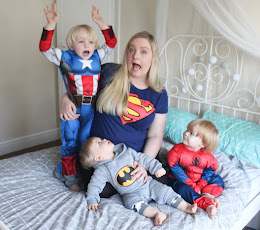 I could have waited until it's sorted to share these photos of course but this is real life with children so why pretend everything is always perfect?!!! 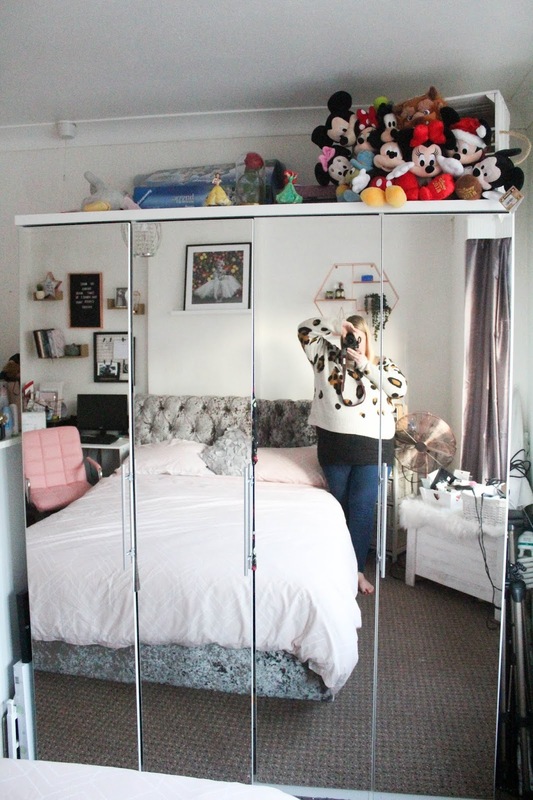 Another recent addition is our new wardrobe which I got from Very back in January. We'd been using a set of wardrobes which were in the property when we moved in after being left behind by the last tenant, and they really weren't in good condition - they also weren't big enough for us so after 4 years of making do with those we decided it was time for something new. 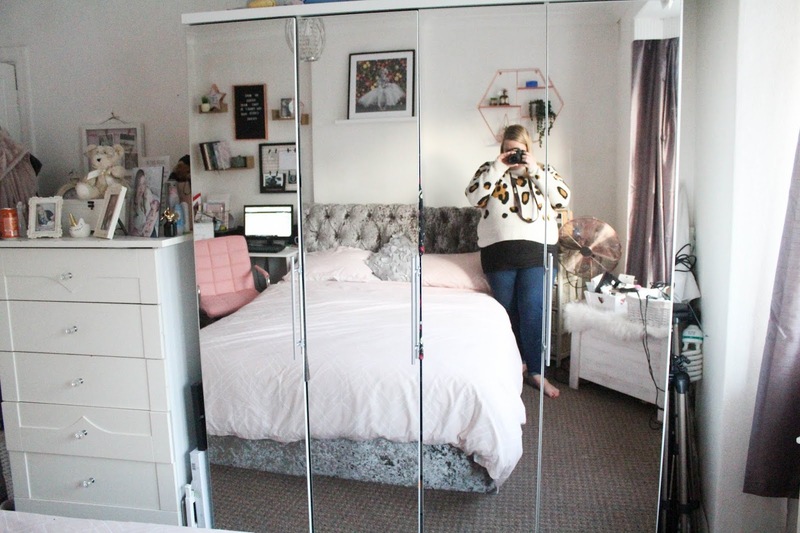 I love the mirrored one we've chosen as not only does it provide ample space for both of our clothes and shoes, but it takes away the need for a separate mirror and it helps to brighten the room as well as making it seem bigger. I had wanted to try and keep the top of it clear, but me being me I couldn't resist a bit of a Disney presence in the room! So that's how our bedroom looks right now. I know it's not as stylish and glam as most peoples you'll see online but it works for us and we really like it!